Benjamin Moser, in his introductory essay to Clarice Lispector’s Água Viva, writes “Clarice pushed her language as far as it could go without risking incoherence. The book was written in fragments, and Olga Borelli’s editorial method, she wrote, was ‘breathing together, it’s breathing together. '” In Água Viva Lispector eschews traditional narrative structure and adopts a fragmentary form more familiar to readers of Beckett. Though Lispector evinces a Beckettian influence her style is less bleak, and takes less risk of a total collapse of meaning. I see that I’ve never told you how I listen to music-I gently rest my hand on the record player and my hand vibrates, sending waves through my whole body: and so I listen to the electricity of the vibrations, the last substratum of the reality’s realm, and the whole world trembles inside my hands. Though the fragments are not arranged by logic or driven by plot or circumstance, they are joined by their adjacency. An intimation begun in one fragment may be driven into the next or never reprised. The coherence of the work is the quivering tension between joy and pain, and the perception of endurance. This New Directions edition of Água Viva is translated by Stefan Tobler. 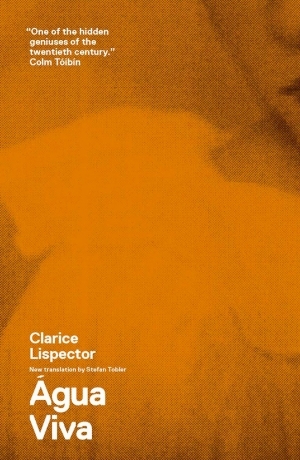 My first Clarice Lispector book has disarmed me utterly with no less a thrill than my discovery, a long time ago, of Duras, Beckett and, more recently, Darwish. This entry was posted in Benjamin Moser, Clarice Lispector, Mahmoud Darwish, Marguerite Duras, Samuel Beckett, Stefan Tobler by Anthony. Bookmark the permalink. The opening line of Agua Viva absolutely hooked me, not for the religious connotations but for the sheer musicality of the writing. That Hallelulah was so well done. And this – “The coherence of the work is the quivering tension between joy and pain, and the perception of endurance.” is absolutely right. I think you would really enjoy The Hour of the Star – there is more narrative, less wordplay for the sheer fun of it, but it has a similar feeling. And perhaps one of the very best ending lines I’ve ever read. Ever. Yes, me too, Michelle, I spent well over an hour reading and rereading the first paragraph. I’m sure I’ll be reading all Lispector’s fiction and then the Moseley biography. I followed the link from your end of year roundup, and I’m glad I did. This sounds like itself, which so many books aren’t if that makes any sense at all. How did you discover her? I honesty cannot remember now, Max. I think I came across a copy of The Apple in the Dark in the LRB bookshop and liked the look of it. Having bought it, I put it aside. There has been quite a bit of noise on my Twitter TL about Lispector, which prompted me to buy this set and read Água Vida.